The Backstory: Our home is a 1970’s ranch and the kitchen underwent a major renovation back in 1995….completely gutted with all new golden colored oak cabinets, a cream colored tile backsplash (with floral accent tiles here and there), and a light colored very neutral formica counter top. It was really lovely at the time, but it’s certainly outdated now. And has been for many years. About 10 years ago I wanted to at least change the backsplash. We didn’t want to go through the trouble of tearing it all out- and I didn’t know what else to do with it, so I simply painted over it! Yep! You CAN paint over tile. I just slapped that latex paint right over the tiles and grout and everything. It was good enough for me, for the short term at least. About 5 years ago, we started seriously contemplating a major kitchen renovation- new counters, new cabinet faces and color, and a modern backsplash. Lack of funds and indecisiveness put that on hold. 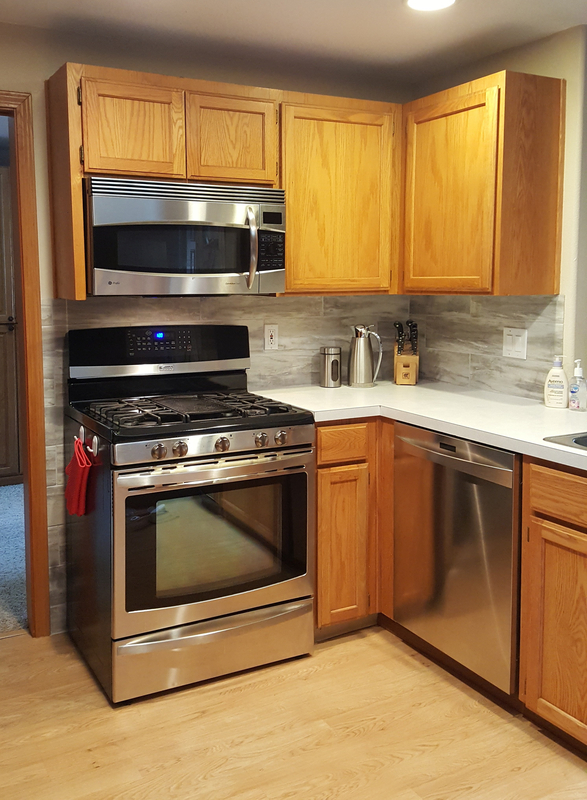 We talked about just doing the backsplash to change the look, but couldn’t justify the expense of a new tile backsplash when the bottom row would likely get damaged when we tear out and replace the countertops. And what if we decide to completely change the kitchen- move the appliances and cabinets? All that work and expense would be wasted. What if I could create a temporary backsplash? Something inexpensive, yet modern, something that will look good and hold us over for another 5 years or so, until we can decide WHAT we want to do with our kitchen layout (and hopefully have some funds to support that dream as well). It has to be inexpensive enough that I’ll feel OK tearing out. And I stumbled up on this…..
Vinyl peel-and-stick flooring tiles…at Home Depot! And they are grout-able to make them look like tile! I wondered if I could cut them in half lengthwise, making them into 6″ x 24″ planks…. so I bought one, brought it home….and the answer is yes! Total cost= $68.71 (not including the mud to repair the wall damage, or the paint to change the wall color above the cabinets). Saturday morning I spent the first part of the day spackling/mudding to repair the damage to the wall so I could start with a smooth and fresh surface. I spent the rest of the day painting above the cabinets and at the edges where the new planks would end. Before going to bed that night, I rolled a coat of B-I-N primer over everything to hopefully help with the adhesion of the peel-and-stick tiles. Sunday the entire day was spent cutting and installing planks. I ripped each vinyl sheet in half to make 6″ x 24″ planks. Super easy to do- just score it a few times with a razor blade, then bend it to snap the cut into a perfect edge. I needed to rip the top planks into a shorter height….those ended up being 5.25″ tall. I made sure that the planks would line up at the edge of an outlet so I wouldn’t need to make any “holes”. Much easier to cut an opening out of the end (instead of in the middle!). The corner by the stove took me over an hour to plan out because I had TWO outlets to match up, all the while ensuring my seams lined up exactly to be at the half-line on a full plank. Geesh! I had hoped for a more consistent full-plank look, but there was no way to get the outlet to line up with that. Oh well. I used Liquid Nails to adhere them to the wall since the ‘peel and stick’ adhesive wasn’t strong enough to keep the tiles on the wall (they are meant for the floor). Tile spacers are VERY important for this project if you plan to grout! I opted for a 1/4″ gap between the planks. Everything had to dry/cure overnight before I could grout. It’s normal grout- use a float and a sponge. Fortunately it doesn’t take much since the tiles are so thin (not like regular tiles). The Fusion Pro grout dries VERY quickly so I could only do a 3′ section before I had to stop and clean it….before moving on to the next section. The very last thing I had to do was bring the outlets forward a bit. That meant shutting off the power, unscrewing them, putting spacers behind them, and screwing them back into place. Super easy. By Monday afternoon- I had a completely “new” kitchen! Still not a completely “modern” or “trendy” kitchen, but at least it looks a little better! 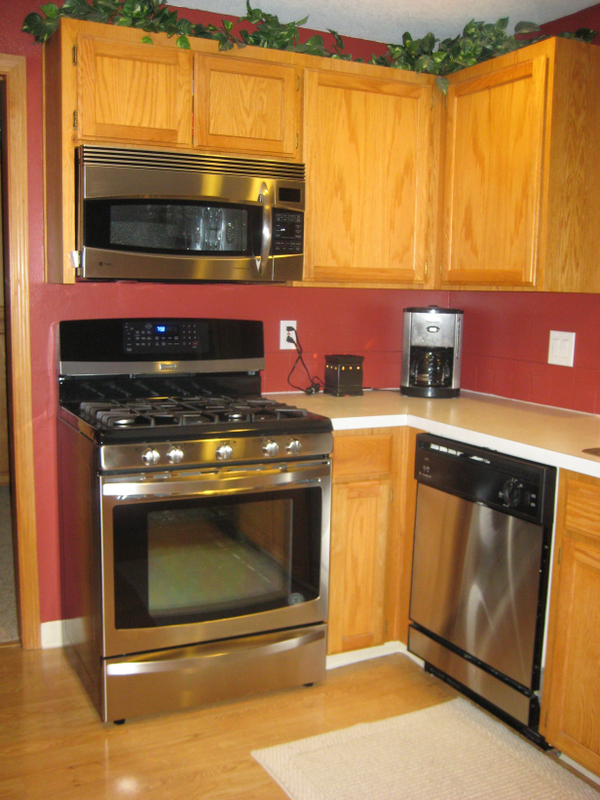 Better planning would have had this job done in two days….but changing the whole look of my kitchen for under $70? PRICELESS! Note: Due to the damage to the walls from the tile removal, I did have to bring the backsplash out a little farther than the old one….which might seem kinda weird since it doesn’t line up with the cabinet edge… but really… I’d rather that, than a defective looking patch-job wall! I FINALLY (10 years later) have a backsplash that makes me happy!